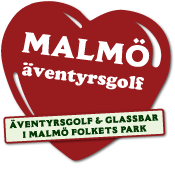 Malmö Aventure Golf is a modern entertainment attraction based on the classic summer activity minigolf. But we have taken it far beyond the classical campground and tournament courses with wooden railings etc. We play on artificial grass and with a golf ball to create challenging putting. We have, with our experienced team, been able to create an attraction that rewards the visitor with lasting memories that will render many revisits. Besides from the golf course we offer a modern ice cream parlor, the first Ben & Jerry’s in Skåne. For hungry and thirsty guests we have a close collaboration with the charming restaurant Far-i-Hatten that can be found next door.